In June’s Ewing Observer Helen Kull wrote Dr. John Hough and the Tree Tunnel. The trees in question, Littleleaf Linden, are located on Carlton Avenue and planted in 1897 by Dr. John Stockton Hough. The Ewing Environmental Commission thinks, then, that the July Tree of the Month, Littleleaf Linden (Tilia cordata), would be appropriate. 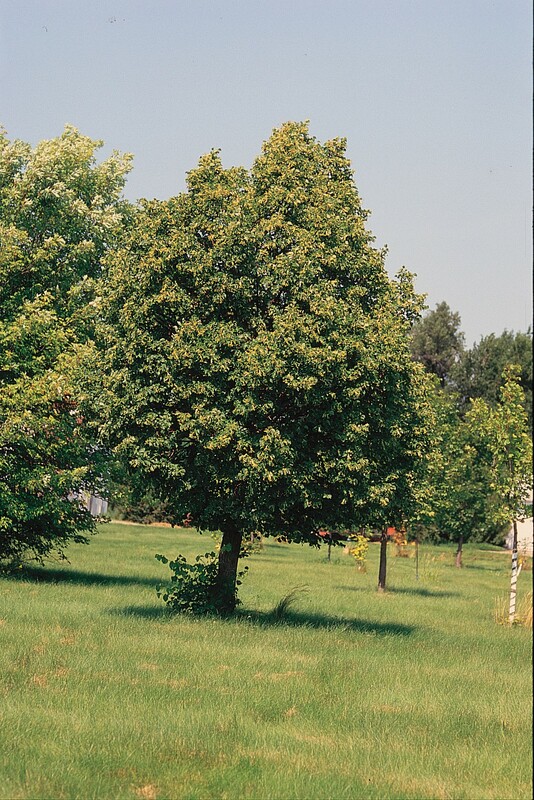 Native to western and central Europe, Littleleaf Linden has naturalized widely over the northeastern United States and parts of Canada from USDA Hardiness Zones 3 to 7 (Ewing is in zone 6B). This tree can be identified by its heart-shaped, alternately arranged leaves which measure 1.5 to 3” long, and the unusual arrangement of the flowers in the spring. The leaves are a glossy dark green on top and lighter-colored below, with margins which are shallowly but sharply toothed. The flowers, in groups of 5 to 11, and then the nutlets, arise on a short stalk from the axil of the leaf and the stem. They are attached to a curved, bract-like, light green “wing”. The pale yellow flowers are not showy but heavily scented in the spring; they attract many bees and butterflies. Sometimes the buzzing of all the bees can be heard many feet away. The bees produce a very delicious and valuable honey from the linden tree. The nutlets, which develop from the flowers, are cream colored to brown and .2 to .3 inches in diameter. Littleleaf Linden has a bark which is furrowed and ridged (the bark is smooth when young). The tree can reach 80 to 90 feet in height and is pyramidal under normal conditions with upright, spreading, and dense branching. The trees on Carlton Avenue have a trunk diameter ranging from 2 ½ to 3 feet, but the tree shapes have been altered considerably in the last 117 years by pruning and crowding. Lindens mature slowly, are long-lived, and some trees in Northern Great Britain are estimated to be over 800 years old. These trees, while considered urban tolerant, are not especially tolerant of heat, drought, salt, restricted root zones, and poor soil. However, they are wonderful shade trees, street trees, and even dense hedges, doing best in moist, well-drained, fertile soil and full sun. They frequently do not do very well with fall planting. Littleleaf Lindens are fairly disease resistant but do attract Japanese beetles, aphids, some moths and lace bugs. Lindens have been used for medicinal purposes over the years as poultices, teas, and herbal remedies to address inflammations, colds, digestion, hysteria, fever, coughs, and various other ailments. The wood is not very sturdy but in the past it was considered holy and used extensively for religious carvings. The wood is white and is finely grained.